Snell’s 22.2-point rise from 2017 to 2018 is also the biggest rise from one season to the next in Box-Toppers tracking history, which began in 1995. It breaks the previous record held by Indians pitcher Corey Kluber, who had a 20.8-point rise from 2013 to 2014 (5.0 to 25.8). Snell’s 27.2 Box-Toppers points in 2018 ranks as the 12th-highest single-season Box-Toppers point total in 24 seasons of tracking. This was Snell’s best season by far. In 2016, he had 4.0 Box-Toppers points (making 19 starts in his rookie year) and had 5.0 points in 2017 (making 24 starts). He made 31 starts in 2018. Snell, the American League Cy Young winner, was Player of the Game 21 times in 2018, earning the win 20 of those times and picking up a no-decision once. Snell led all pitchers in total wins with 21. He earned AL Player of the Day honors six times (worth 0.7 bonus points each time) and overall Player of the Day honors twice (worth 1.0 bonus point each time). Dodgers pitcher Walker Buehler had the biggest gain in Box-Toppers points from 2017 to 2018 among both National League players and rookies. His 15.1-point gain was the second-biggest gain among all players. He earned 15.1 points in 2018, his rookie season, 15th among all players and fifth among NL pitchers. Ronald Acuna Jr. of the Braves had the biggest gain in points among all batters. Acuna had a 9.2-point jump in 2018, earning 9.2 Box-Toppers points in his rookie season. Acuna was also voted NL Rookie of the Year. He is the only exclusive batter among the 25 players on Box-Toppers’ most-improved list. Shohei Ohtani of the Angels is the only other player on the list listed at a batting position. Ohtani had an 8.0-point gain in 2018, the 21st-biggest rise from 2017 among all players. Ohtani earned 8.0 Box-Toppers points in 2018, his rookie season, however, he earned 4.0 points as a starting pitcher and 4.0 points as a designated hitter. Ohtani won the AL Rookie of the Year award. 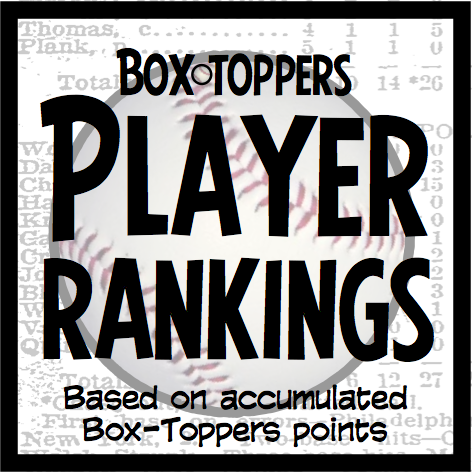 Ohtani is technically in a three-way tie with two other rookies who earned 8.0 Box-Toppers points in their first season in 2018. Pitchers Domingo German of the Yankees and Lou Trivino of the Athletics also both earned 8.0 points in 2018. Ohtani is given the edge over them and placed in 21st place among improvers, because he held a tiebreaker for earning half of his points as a batter. German and Trivino are placed in a 22nd-place tie with their 8.0 points, all earned as rookie pitchers. The Atlanta Braves have four players among the top 25 improvers, most of any team and indicative of their improvement from 2017 (when they finished with a .444 winning percentage, third place in the NL East) to 2018 (when they finished with a .556 winning percentage, winning the NL East). Mike Foltynewicz , pitcher, who had the ninth-best improvement of 9.7 Box-Toppers points, earning 13.7 points in 2018 and 4.0 in 2017. Ronald Acuna Jr., leftfielder, who had the 13th-best improvement of 9.2 Box-Toppers points, earning 9.2 in 2018, his rookie year, and none in 2017. Sean Newcomb, pitcher, who had the 21st-best improvement of 8.4 Box-Toppers points, earning 11.4 points in 2018 and 3.0 in 2017. Julio Teheran, pitcher, who had the 25th-best improvement of 7.7 Box-Toppers points, earning 12.7 points in 2018 and 5.0 in 2017. Major League Baseball’s Comeback Player of the Year awards have some similarity to Box-Toppers’ Most Improved Players list. The AL Comeback award went to Red Sox pitcher David Price, who ranked eighth among Box-Toppers’ improvers, gaining 9.7 Box-Toppers points over his 2017 total. In 2018, Price had 14.4 Box-Toppers points and in 2017, he had 4.7 points, which was his career-low over 10 seasons. Price’s best season was 2015 with the Tigers and Blue Jays, when he had 21.1 Box-Toppers points, fifth among all players. He had 12.4 points in 2016 with the Red Sox, ninth among AL pitchers. The NL Comeback award went to Braves closing pitcher Jonny Venters , who earned 1.0 Box-Toppers point in 2018. However, it was his first point in more than six years. He has undergone four major medical procedures on his pitching elbow, including three Tommy John surgeries. Venters was Box-Toppers Player of the Game on Sept. 12. Previously, he was Player of the Game April 25, 2012. He did not pitch in the Majors from 2013 to 2017. One player on the list of 2018’s top 25 improvers was also on last year’s list of top 25 players who Box-Toppers point total declined most from 2016 to 2017. Yankees pitcher J.A. Happ had the sixth-biggest improvement from 2017 to 2018, gaining 10.0 points from his 5.7 point total in 2017 to his 15.7 points in 2018. However, in 2017, Happ had the 17th-biggest decline from his 2016 point total of 9.0 points, earning 14.7 points in 2016 and 5.7 in 2017. Happ played for the Blue Jays from 2016 until he was traded in late July 2018 to the Yankees.